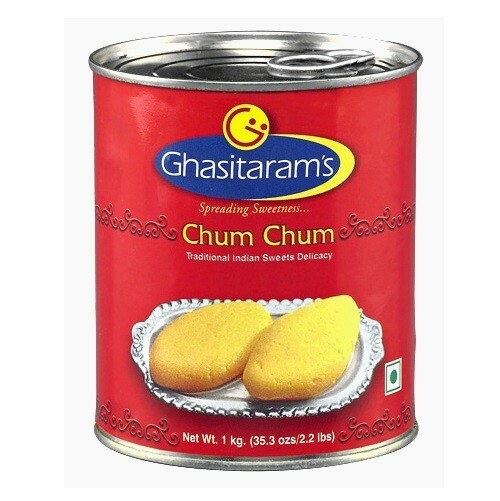 Buy Chum Chum Tin of Ghasitarams from Mumbai online | Authentic Indian Sweet , Savories and Delicacies from the place they originate by Moipot. An authentic traditional Bengali mithai recipe prepared from chhena or curdled milk, Chum Chum is a spongy delight that squirts sweetness with every bite. Indulge in these soft spongy dumplings and treat your sweet tooth to the best of Indian sweets. Order this deliciousness today from Moipot and let this exotic piece of heaven delight the people of all ages. The freshest product is packed at vendor's shop and shipped directly to you. As the product gets shipped pan India, special care is taken to make sure this item reaches you in an undamaged condition for which it is packed in a special packaging material. This might incur a packaging cost of 50 rupees which is already included in the above mentioned price.